Here is your chance to win a signed hardback copy of Beyond Lucky by Sarah Aronson. This is a great middle grade soccer book with a male protagonist. Click here for my book review of Beyond Lucky. TO ENTER: Leave a comment in the comments section of this post or the book review post of why you want to win. Make sure you leave a contact email in case you are the winner in this format anynameatgmaildotcom. Want An Extra Entry? Follow my blog for an extra entry. Already a blog follower? If you are already a blog follower you can earn an extra entry by tweeting the following: I want to win Beyond Lucky #giveaway from @boystobooks. 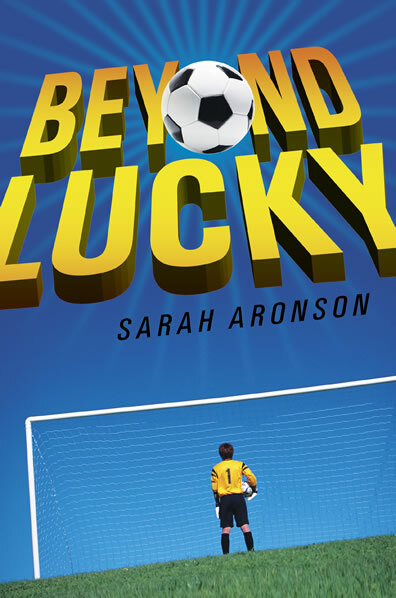 A huge shout out to SARAH ARONSON for generously donating a signed copy of Beyond Lucky for the blog giveaway. You may visit her website here. Make sure you check out here silent auction on her website. Contest ends Saturday August 27 at 6:00 p.m. MST. Winner will be notified by email and will have a week to respond with mailing address. Labels: beyond lucky, blog contest, book giveaway, Free book, soccer, soccer book. I would love a copy of this book! I'm trying to build my son's library and this sounds like an excellent one to add to his growing collection for when he is older.